I suffer from anxiety and depression. These are issues that influence my life on a daily basis, so I am quite attuned to them. I started to notice that sometimes, while I was drinking coffee, I would begin to have those tell-tale feelings of anxiety, and it made me wonder if it was the coffee triggering these attacks. After doing a little research, I found that I am not the only one out there who suffers from this specific problem. How, you may ask. Caffeine works by blocking the depressant function of a chemical called adenosine. For most people, the result is a pleasurable feeling of energy and the ability to focus (Vogin para. 7). However, that same energy-inducing drug can cause the jitters. In people predisposed to anxiety disorders, caffeine can trigger increased heart rate, sweaty palms, ringing ears, all leading to a full blown panic attack (Vogin para. 8). So why does caffeine make some of us feel great and induce panic in others? People with anxiety disorders experience caffeine’s affects as signs of impending doom. This then allows their anxiety to take over. One study has found that, among healthy college students, moderate and high level coffee drinkers scored higher on a depression scale than low users (Murray para. 2). Several other studies have found that caffeine intake has been positively correlated with the degree of mental illness in psychiatric patients, especially related to panic disorders and depression (Murray para. 3). Of course, these study results could also be due to chance. It is possible that caffeine had nothing to do with it, but my personal experience leads me to believe these results are accurate. If these results are wrong, they are a false positive. In class, Andrew talked about the harmful affects of sugary drinks. It is important to remember that the caffeine in these drinks can be harmful also. Murray, Michael T. “Can Caffeine Worsen Depression And Anxiety?” MindBodyGreen. N.p., 31 Oct. 2013. Web. 22 Oct. 2014. <http://www.mindbodygreen.com/0-11425/can-caffeine-worsen-depression-and-anxiety.html>. Vogin, Gary. “Brewing Trouble.” MedicineNet. N.p., n.d. Web. 22 Oct. 2014. <http://www.medicinenet.com/script/main/art.asp?articlekey=50820>. This entry was posted in Uncategorized and tagged anxiety, caffeine, coffee on October 22, 2014 by Macy Cellitti. I am an avid coffee and tea drinker myself, and I also suffer from mild anxiety. I had found that when I drink coffee that I experience much more severe feelings of anxiety than I do when I drink tea or stay away from either beverage. However, if I stay away from coffee for a couple of days, I feel my anxiety levels fall back to their normal range. So my question is whether or not caffeinated drinks have long term affects on one’s anxiety levels or if they are just temporary (the duration that the caffeine is in one’s system)? If the students who were drinking coffee in the study were asked to stop drinking their coffee for a couple of weeks, would their anxiety levels decrease? Or is permanent damage done? Maybe people who would consider themselves caffeine addicts could conduct an experiment on themselves and learn how well they cope off and on coffee or tea. Kendall, if you check my works cited you’ll see that the article you posted in your comment is one of my original sources. My fourth paragraph is even based on the article. But don’t worry, I forgive you considering you wrote this comment at 3am. I appreciate your feedback. Caffeine is definitely an addictive drug and with addiction comes withdrawal. Before my anxiety got worse, I used to be addicted to coffee. If I would forget to have a cup one day, by dinner time I would have a horrible headache and just not feel well. I needed the caffeine. As soon as I realized I was addicted, I quit cold turkey. Quitting caffeine is only a miserable experience for a few days at the most, and it’s definitely worth it. Gabrielle, thank you for sharing that article. It definitely does depend on the person drinking it. When someone has an anxiety attack, a fast heart rate is a part of that negative experience. Caffeine speeds up one’s heart rate as a part of its wake-you-up-and-energize-you-experience, so to someone with anxiety, that increase in heart rate can be synonymous with the feeling of a panic attack. Therefore, it can easily bring one on. I hope that makes sense. So even though the coffee jitters aren’t negative to you, they can definitely be negative to other people. While I do agree with what’s written in this post and article, and the studies are probably true, there are studies that show an opposing theory. Psychology Today (http://www.psychologytoday.com/blog/your-brain-food/201110/why-does-coffee-make-us-feel-so-good) explains a study that says coffee makes us feel good. Coffee stimulates the release of dopamine in our body, and dopamine produces a pleasant feeling. I personally do not suffer from anxiety or depression, but I definitely do feel jittery when I drink coffee (and I’m writing this post as I sip my french vanilla iced coffee with cream and sugar). 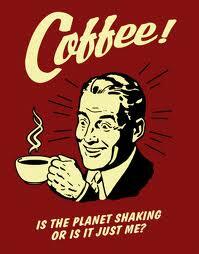 Although, I can’t say it’s a bad jittery feeling, so maybe the effects of coffee depend on the person drinking it. As I was reading your post I could relate to everything that you mentioned. I also suffer from anxiety and depression. Caffeine triggers my anxiety and I try my best to stay away from it. When I was younger I found out that foods containing a large amount of sugar would set it off. Now that I am older I have learned what foods/drinks I should stay away from and what food/drinks may actually be beneficial. http://www.everydayhealth.com/anxiety-pictures/anxiety-foods-that-help-foods-that-hurt-0118.aspx#01 Here’s an article that talks about foods that may help or worsen your anxiety.